First year Hillsboro FFA members learned the importance of hog showmanship on Aug. 28. Seniors Jordan Williamson and Regan Claycomb and sophomoreZinny Adams instructed the young members on how to properly show a hog. They were taught how showmanship is mostly about working with your animal before the show. The freshmen learned how hard showmanship is and how much work goes into getting ready for the fair. Before going down to the barn they learned the basics of showmanship. From techniques to brushes, they covered all parts of showing a pig. When learning the tools used in showmanship, they learned proper skin and hair care for swine. Doing this helps to instill a sense of responsibility and gives them an experience to get them active in showing and the fair. Pictured is Ethan Parry exhibiting the skills in showing a pig. 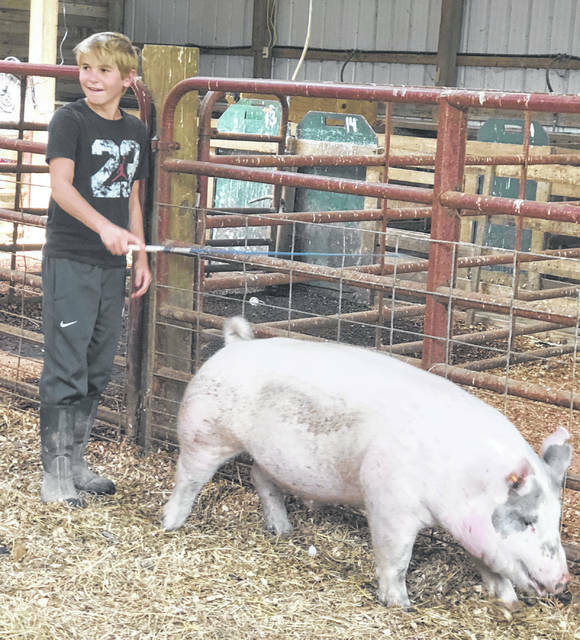 https://www.timesgazette.com/wp-content/uploads/sites/33/2018/09/web1_Showmanship-pic-1.jpgFirst year Hillsboro FFA members learned the importance of hog showmanship on Aug. 28. Seniors Jordan Williamson and Regan Claycomb and sophomoreZinny Adams instructed the young members on how to properly show a hog. They were taught how showmanship is mostly about working with your animal before the show. The freshmen learned how hard showmanship is and how much work goes into getting ready for the fair. Before going down to the barn they learned the basics of showmanship. From techniques to brushes, they covered all parts of showing a pig. When learning the tools used in showmanship, they learned proper skin and hair care for swine. Doing this helps to instill a sense of responsibility and gives them an experience to get them active in showing and the fair. Pictured is Ethan Parry exhibiting the skills in showing a pig.